All Saints is the best of the Stoke Ferry group of churches. Since the closure of the former parish church of Stoke Ferry, it is also the parish church for that large village. 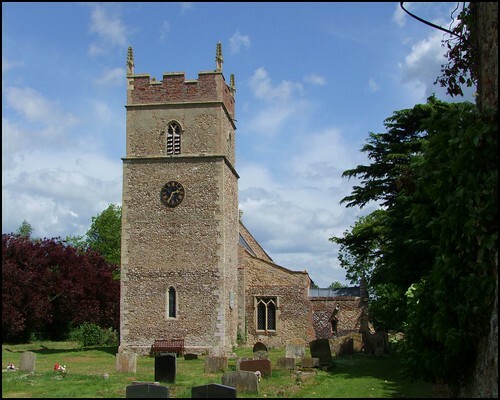 Its handsome crowned tower rises above a long graveyard overlooking the village green. It is not a big church, and the body of it seems to fold behind the tower, the south aisle like one wing extended. The chancel is largely of carstone, the rest largely of flint. This church is open every day, unusual in south-west Norfolk and a reason for the parish to be thanked and congratulated. As at neighbouring Wereham, with which this church has much in common, the building was relatively complete by the 13th century. Happily, the Victorian restoration here was not as overwhelming as it was at Wereham, although the roofs all date from this time. Curiously, both the north and south entrances (that to the north filled in) appear 'Norman' in shape, but neither have any stone dressing surviving. A curiosity, because the Victorians were generally fond of Norman. Perhaps the doorways were too badly damaged. You step rather steeply down the the south doorway. Mortlock found steps, but now there is a perilously cambered floor, as if in a funhouse. You step into a slightly ramshackle church which is full of interest, and full of the feel of its parish in the lively days of the early 17th Century. The best feature is the set of locally carved benches of 1627, dated and signed by the churchwardens. Sam Mortlock observed that the leaf design along the back is also to be found on the reading desk, suggesting that it was made by the same village craftsman. Some early glass survives. There is a roundel of a white rose, and a chalice and cup which may be continental. The rather dim George III royal arms above the tower arch are, as Mortlock points out, annotated Springfield and Sons Painters 1816, the only example he knows of in Norfolk of a set signed by the manufacturers, and the only set I know of too. A curiosity: outside on the north side, obscured by greenery, a cast iron bracket sticks out beneath a window. What on earth can it have been for?